I have always been fair skinned for as long as I can remember. It was not until I hit 3-0 that I actually had to face the reality of having to take care of skin imperfections. Most of which were particularly brought about by abusing my skin, basking on the sun without protection, et. al. Good genes can be an edge, sure. But take it all for granted and the sun will show you no mercy. I currently am sporting tiny sun spots and some nasty milia here and there and occasional pimples. Although my sun spots are not yet conspicuous, I know sooner or later they are bound to beam the world “hello,” and I’m hoping to have that intercepted of sorts. And the very informative talk during Neutrogena’s launch of their Fine Fairness range last June 23, 2010 at Society Lounge in Makati City, was just the thing for me. The innovative beauty product claims the ability to replace those melanin-carrying cells with brand new ones. The hyperpigmentation solution in particular got my full attention. “Neutrogena’s HealthyWhite™ Complex, found in the Fine Fairness® Range, is Neutrogena’s answer to the need for newer whitening alternatives that offer natural combination synergies for safer and more efficacious depigmenting treatment,” explained Robert Kwon. This complex has the unique combination of Essential Soy™, Niacinamide (Vitamin B3), Ascorbyl Glucoside (Stabilized Vitamin C) and Portulaca Extract (natural plant extract) make the Neutrogena HealthyWhite™ Complex the most technologically advanced skin lightening treatment that targets hyperpigmentation at its source. Neutrogena Fine Fairness Range makes use of Essential Soy™ which blocks or limits the transfer of melanin to keratinocytes (the epidermis or outermost layer of skin). This results in a more even skin tone and brown spot reduction. While Stabilized Vitamin C, a powerful antioxidant, blocks free radicals and reduces melanin formation by preventing the tyrosinase enzyme from converting tyrosine into melanin. This stable form of Vitamin C also ensures a long-lasting healthy glow and is known to protect the skin from sun-induced redness. Vitamin B3, on the other hand, is a water-soluble vitamin that works inside-out to renew cells, making skin appear more radiant and translucent. And lastly, Portulaca extract prevents pigmentation and blocks inflammation of the skin’s upper epidermis layer, thus making skin naturally softer. 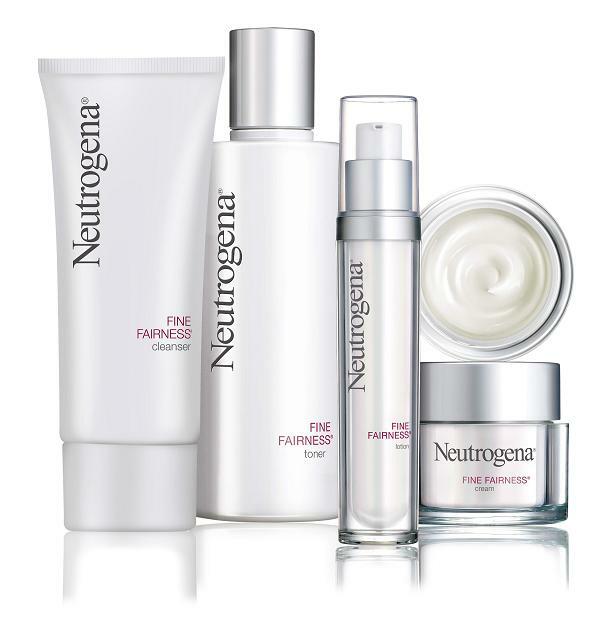 Neutrogena also uses Retinol in the formulation of their Fine Fairness Range. Retinol is also known as pure Vitamin A. It is aa proven anti-aging ingredient that enhances cell renewal and prevents the accumulation and production of melanin. The range also boasts of natural minerals such as mica and titanium dioxide that enhances the reflection of light off the skin, making the surface of the skin appear more radiant; while broad spectrum UVA and UVB Filters filter out both UVA and UVB radiation, thereby preventing long-term formation of uneven pigmentation and reducing melanin production. The four core Fine Fairness® products will be available in stores nationwide beginning June 2010.